One of the most famous epics in Hindu literature, the Ramayana tells of the life and adventures of Rama, a legendary hero who is worshiped as a god in many parts of India. Probably written in the 200s B.C. , the Ramayana is attributed to Valmiki, a wise man who appears as a character in the work. Based on numerous legends, the Ramayana also incorporates sacred material from the Vedas, a series of ancient Hindu religious texts. The Ramayana, a famous Hindu epic, tells of the life and adventures of a legendary hero called Rama. 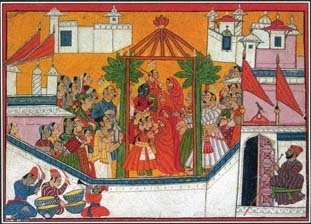 This painting from the 1700s illustrates the marriage of Rama and his brothers. senior wife, Kausalya, gave birth to Rama. The other wives gave birth to Rama's brothers—Bharata and the twins Lakshmana and Satrughna. Rama inherited half of Vishnu's supernatural power, while his brothers shared the rest. See also Brahma ; Devils and Demons ; Hinduism and Mythology ; Indra ; Rama ; Vedas ; Vishnu .